On 28th February 2016, Argentina finally reached a settlement with the rest of its holdout creditors lead by Elliot Management in what is being hailed as ‘historic’ signalling the return of Argentina to international bond markets. While the pesky details of the settlement agreement are yet to be hammered out (at the time of writing), it is however known that in substance, Argentina has agreed to shell out a total of around $4.4 billion to the holdouts including Elliott Management, Aurelius Capital Management, Davidson Kempner and Bracebridge Capital. In sum, that represents a 25% write down of the original debt amount previously owed to the funds. While indeed, the present agreement unlocks Argentina’s financial leg room in the international capital market, thus providing a fillip to its already distressed economy, the agreement is also a manifestation of almost 15 years of desolate and futile negotiations, characterized by opportunity costs, derailed investments, scarce liquidity and immense deadweight losses leading to a general reduction in economic welfare. That apart, one wonders whether it is ethical or moral for a few set of private funds to arm-twist a sovereign into a contractual enforcement claim, that causes at best a deflection of governmental resources towards defending such claims and at worst, obstruction and hindrance in performing essential governmental functions. Moreover, in the present instance, there was every possibility that the deadlock would have continued unabated, lest for Judge Griesa’s unflinching stance towards a resolution. By indicating his disapproval for continuing with the ‘no pay-out’ injunction against Argentina, which had hitherto allowed a leverage to the holdouts in the negotiations, Judge Griesa tilted the balance in favour of Argentina, finally leading to the settlement. Flashback to 2012 and readers will remember that Greece, during its debt restructuring phase, had similarly experienced a holdout situation characterized by a minority group of bondholders demanding for a full pay-out. It was indeed to avoid a long drawn court ligation, that Greece readily agreed to pay the holdouts in full (around €6billion), inviting criticism from various quarters for its compromising stance and for setting an undesirable precedent. Both the Greece and Argentinian debacle shows that sovereign defaults are a recurring phenomenon, and the absence of definitive rules, leads to a messy, prolonged and an unsatisfactory outcome. Against that backdrop, this post argues that the entire episode ought to nudge policy makers around the world to acknowledge and act upon the problem of holdouts on a more sustained, determined and collective basis. On 31st July 2014, with negations between the Argentinian government and its bondholders at a draw, the country defaulted on its sovereign debt for the second time in about a decade. 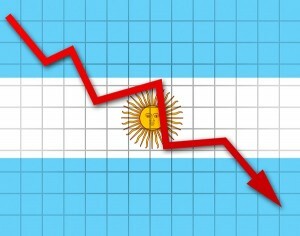 At the heart of the problem was not the ‘unwillingness’ of Argentina to service its debt and honour its obligations under the debt restructuring plan as agreed in 2005 & 2010, but the obstructionist methods of a minority group of creditors/bondholders to stall the process and bring the country towards a default. Such bondholders are variously described as ‘holdout creditors’ and usually comprise of certain vulture funds which buy distressed assets at very low prices, at time when the country is facing a crisis, in anticipation of being paid out in full during the debt restructuring process. The holdouts take advantage of the fact that any debt restructuring plan requires the consent of all creditors and thus employ myriad forms of tactics such as prolonged negotiations and court litigation to reclaim their amount. In 2012, a New York district-court interpreting the pari passu clause ordered Argentina to either pay out its holdout creditors most notably NML Capital (subsidiary of Elliot Management) to the tune of $ 1.3 billion or stop paying out majority bondholders who had accepted the debt restructuring plan. Having rather limited options, Argentina was forced to renegotiate with NML Capital and other holdout creditors which resulted in an ultimate stalemate on 30th July, bringing the country to another default. Presently, bond contracts are governed either by the sovereign’s own law (as was the case of Greece) or a foreign law, usually New York, English or German law. However, not all bond contracts provide for Collective Action clauses (CACs) whereby a super majority of creditors can bind minority creditors as regards the restructuring terms thereby eliminating the holdout problem. As the Argentinian saga shows, it is not always possible to include CACs either in financing agreements or to choose a law which provides for one. Argentina had close to about 152 classes of bonds governed by the laws of eight different jurisdictions and even with the inclusion of CAC’s, it would require the country to reach a consensus on each of those bond issues separately. For the above set of reasons and more, CACs do not provide an adequate and effective response to the holdout problem and have been considered by some to be ‘an exercise in futility’. Apart from the contractual market based approach, various scholars have advocated for a more robust, institutionalized, rules based international sovereign restructuring mechanism. A first formal proposal was mooted by Anne O. Krueger, the then Deputy Managing Director of IMF, in 2002 and was called the Sovereign Debt Restructuring Mechanism (SDRM). It was envisaged under the aegis of the IMF through a simple amendment of its articles of agreement (AOA). In essence, it would build on the near universal membership of the IMF, to provide for a platform to effectively negotiate a debt restructuring plan between sovereign debtors and its creditors. To address the holdout problem, it provided for mandatory rules on supermajority voting enjoining all the members to implement the same in their national legislations. Further, to streamline the restructuring process, once it has been activated, it advocated for a temporary stay of litigation against the sovereign debtor. The proposal went a step further to address the issue of stop gap funding which a sovereign may need during the restructuring process, to continue essential governmental functions, by providing for priority status for any new funding as against old debt. Ambitious as it was, the proposal could not see the light of the day because of a lack of political will from member countries, especially the US. That however has not diminished the momentum and enthusiasm of sovereign debt lawyers and academics in contemplating and devising newer mechanisms to enforce a global bankruptcy regime. Prof. Schwarcz for instance, has argued for a new international convention on sovereign debt restructurings incorporating most of the mechanisms of the SDRM, however operating outside the IMF system. The proposal envisions a reduced ratification obligation for the convention, so as to ensure its early implementation as opposed to the skewed amendment procedures under the Articles of Association of the IMF. Further still, Prof. Heimbold suggests a model law approach to sovereign debt restructurings, inviting member states towards adopting mirroring national legislation with reciprocal obligations, thus ensuring certainty and predictability of the outcome of a debt restructuring exercise. Several such proposals have been advanced with respect to the Eurozone countries in the recent past (for a comprehensive survey see the author’s contribution here) with member states of the European Union gradually warming up to the idea (read the recent report of the German Council of Economic Experts arguing for a similar mechanism). In the light of the recurring sovereign debt problems, most acutely observed in the Argentinian deadlock and not too long ago in the Eurozone countries, it is rather imperative that an international treaty based mechanism, much like the SDRM is seriously considered by policy makers around the world. It would go a long way in facilitating and enforcing an ‘orderly debt restructuring’ with minimum disruptions. In this regard, it is heartening to see that the United Nations General Assembly recently adopted a resolution supported by 134 countries concerning Basic Principles on Sovereign Debt Restructuring Processes on 10th September 2015 (see the author’s comments here). The resolution has captured some of the most fundamental issues plaguing debt restructurings and despite its unassuming tone, offers a substantial basis for future negotiations. A sovereign default is an event of immense proportions for the economy of a country as a whole, having consequences in the nature of fleeting investors, financial and banking crisis, continued recession and a spill over effect on the real economy. The time is ripe to gather as much political will to convince and collaborate at an international level on sovereign debt restructurings. The Ultimate Sovereign Debt Showdown: Russia & Ukraine likely to battle it out in court! This entry was posted in Europe, Greece and tagged Argentina, Creditors, debt crisis, Debt restructuring, debt sustainability, default, Eurozone, IMF, Sovereign Debt, sovereign debt crisis. Bookmark the permalink. 6 Responses to Argentina debt restructuring deal – 15 years too late! It is very unlikely that investors will be as keen to invest in bonds of dodgy EM countries if they tried to shift from safe rule-of-law jurisdictions such as England and New York to a debtor-friendly framework like an SDRM. They could do so, but it would be at a price, as a larger interest premium would reflect lower expected recovery values as well as more frequent defaults. No one forces emerging markets to borrow in foreign currencies. They do it because it is cheaper, and because investors are willing to lend. Countries are free to borrow in their own currencies, or even in dollars, in their own local law; Argentina did so to circumvent Greisa’s ruling. As demonstrated in Greece, such local law bonds are effectively “covenant lite”, leaving lenders with little recourse as they are abused, coerced, and taken to the cleaners. To paraphrase Tolstoy, All happy bonds are alike; each unhappy bond is unhappy in its own way. An SDRM “cookie cutter” solution might be impossible to design and implement well; more importantly there is no need for it. There is a good balance in the current “non system”, with borrowers very able to restructure when needed in an orderly way — if they so choose. If lenders or borrowers are too greedy, or irrational, a default can happen, but that too can be resolved in an easy way, and it usually is. A bankruptcy court and standstill is a good idea for corporations, but for governments, that is exactly what the IMF is for (or bilateral loans, if you are too autocratic, corrupt or backwards, China or Russia are usually happy to support your regime). To be fair, the U.S. and UK used to send gunboats to help recalcitrant debtors see the light and pay up; lots of times their governments lent money to banks or foreign governments so that they could pay back the investors (i.e. donors, voters, or pals from the gentleman’s club) or Citibank and cave in to “moral hazard”. But often investors lose their shirts, as they should, but have every right to enforce their contractual rights to be paid. It is the borrower here who has violated the agreement, after all.